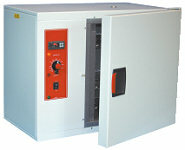 The GENLAB range of Moisture Extraction Ovens are specifically designed to provide rapid drying and removal of excess moisture when standard drying ovens will not perform adequately. 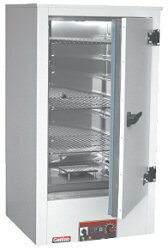 The ovens are specifically designed for the rapid extraction of moisture and are fitted with special large diameter outlet vents suitable for connection to most external extraction systems. The exterior is constructed from sheet steel finished in an easy clean powder coated paint. The interior chamber is made from mild steel coated with aluminium (CLAD) with a stainless steel chamber available as an option. Fitted with fixed shelf runners and removable chrome plated wire grid shelves. Heated by Incoloy sheathed elements fitted around the fan circulation. Units up to 200 litres capacity have a basic control system that comprises of a direct reading thermostst and overheat thermostat, both with calibrated scales and tamper proof locks. They also include mains switch with indicator and heat and overheat indicators. Units 250 litres capacity and larger have a digital control system that comprises a Microprocessor digital temperature, with dual display of set point and actual temperature, and which is auto-tuned for each individual unit to optimise the heat up, overshoot and control of temperature. This is also available as an optional extra to the smaller units. The ovens in this range are the ME/50, ME/75, ME/100, ME/125, ME/150, ME/200, ME/250/DIG, ME/350/DIG, ME/425/DIG, ME/500/DIG, ME/650/DIG, ME/750/DIG, ME/850/DIG and ME/1000/DIG. All units have CLAD interior as standard with the microprocessor digital control as an option below 250 litres.